Create the perfect personalized ring for the man in your life. 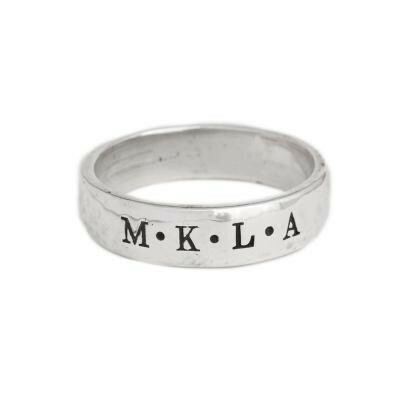 The men's ring can be stamped with initials, a date or a special word. Font is our small block font and is approximately 3mm tall. Available in Sizes 9, 10 and 11. We don't want to leave the guys out! Our organic sterling silver band is the perfect personalized gift for the man in your life. Create a man's ring as a wedding band, a family ring or a simple reminder of a date or sentiment that is important in his life. Dimensions: The hammered sterling silver bands are approx 6mm wide and can be stamped with up to 8 characters/spaces. Sizing: When determining your size, we ask that you give us a size that is a snug but comfortable fit. If you are unsure of your size, you can order a ring and select the option for ring sizer from the drop down and we will send you a ring sizer and instructions on how to send us your size. If you plan on stacking multiple rings you should consider ordering a half to whole size larger depending on how many rings you will be stacking. If you are unsure of your size you can order a ring sizer from the drop down and we will send you a ring sizer in the mail and instructions on emailing us your size.